At Broyhill, our top ten positions make up roughly 80% of the portfolio today and generate a current yield north of 4% (the expected yield on our estimates is much higher). While many active managers over-diversify to reduce volatility, most do so only to reduce the risk of underperforming and losing clients. 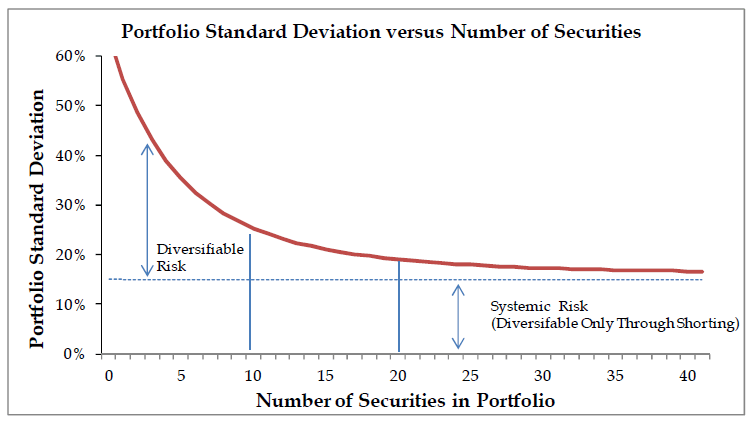 As discussed in a recent paper, appropriately titled Diworseification, “Investors benefit from moderate diversification yet are made decidedly worse off when over-diversification dilutes strong security selection.” For our past, we prefer to concentrate our capital in our best ideas and avoid being bogged down by dozens of lower quality, lower conviction positions. While most “active” managers prefer to hide behind an index-like portfolio, the great majority of idiosyncratic risk is eliminated as the number of securities rises toward ten, as shown in the chart below.